Brugada syndrome (BrS) is a cardiac disease caused by an inherited ion channelopathy associated with a propensity to develop ventricular fibrillation. Implantable cardioverter defibrillator implantation is recommended in BrS, based on the clinical presentation in the presence of diagnostic ECG criteria. Implantable cardioverter defibrillator implantation is not always indicated or sufficient in BrS, and is associated with a high device complication rate. Pharmacological therapy aimed at rebalancing the membrane action potential can prevent arrhythmogenesis in BrS. Quinidine, a class 1A antiarrhythmic drug with significant Ito blocking properties, is the most extensively used drug for the prevention of arrhythmias in BrS. The present review provides contemporary data gathered on all drugs effective in the therapy of BrS, and on ineffective or contraindicated antiarrhythmic drugs. Arrhythmia & Electrophysiology Review 2018;7(2):135–42. The guidelines recommend ICD implantation in patients with BrS who have survived a cardiac arrest, or have documented spontaneous sustained VT (class I).3,4 ICD implantation should also be considered in patients with BrS who have had a syncopal episode suspected to be caused by VT or VF (class IIa). In asymptomatic BrS individuals who have inducible sustained VF during programmed ventricular stimulation with two or three extrastimuli at two sites, ICD implantation is controversial and is a class IIb indication. ICDs are not recommended (class III) in reflex-mediated syncope or in asymptomatic patients.3,4 This recommendation is based on the low yearly event rate of 0.5 % found in asymptomatic Brugada patients,9,10 coupled with the high complication rate reported for ICDs in BrS.11–13 Aggregate rates of inappropriate shocks and lead failure have been reported to be as high as 37 and 29 %, respectively, at 10 years, including one death as a result of inappropriate ICD discharge resulting from lead failure.14,15 A near-fatal VF in BrS despite an implanted ICD has been reported, suggesting that lone therapy of ICD in cardiac arrest survivors with BrS is not without risks.16 The death of a BrS patient diagnosed after syncope (with an ajmaline provocation test), due to incessant VT and VF that developed during lead extraction procedure, has also been reported.17 In children and adolescents with BrS, high rates of inappropriate shocks and device-related complications were reported at 20 and 14 %, respectively.18 The option of subcutaneous ICD (S-ICD) for young patients with inherited arrhythmic syndromes who do not need pacing therapy is being increasingly used. A recent study found high rates of sensing screening failure in patients with BrS, due to high T wave voltages.19 Long-term clinical data are lacking at present on the utility of S-ICD in BrS. A pharmacological therapy approach aimed at rebalancing the epicardial action potential in the right ventricle and normalising the action potential dome can prevent arrhythmogenesis in BrS, unlike a device therapy approach, which addresses only the symptoms of BrS without preventing the arrhythmias from occurring. Drug therapy in BrS has several utilities: first, in the acute management of arrhythmic storm; second, in prevention of arrhythmic events in patients with implanted ICD who require many shocks; and third, as an alternative to ICD implantation when the latter is contraindicated, not feasible (infants and young children), unaffordable, or refused by the patient. This review provides contemporary data gathered on all drugs effective in the therapy of BrS as well as ineffective or contraindicated antiarrhythmic drugs that should be avoided. 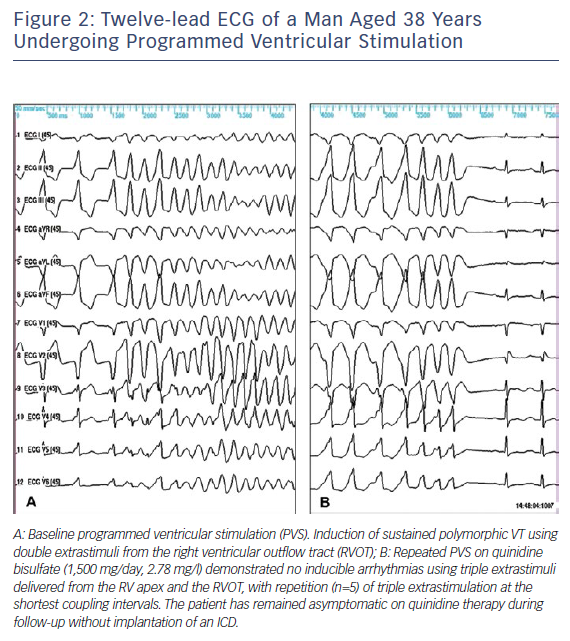 The first case showing the efficacy of oral quinidine in preventing inducible VF during electrophysiological study (EPS) and recurrent arrhythmias was reported in 1981 by Belhassen et al.22 in a young male with recurrent storms of idiopathic VF (IVF). This patient is still arrhythmia-free on quinidine treatment and with no implanted ICD after a follow-up of 39 years. Two of the five patients with IVF successfully treated with EP-guided class 1A antiarrhythmic drugs (AD) were later diagnosed as suffering from BrS.23 The first prospective series of 25 BrS patients treated with EP-guided therapy were also reported by Belhassen et al.24 Quinidine prevented VF inducibility in 22 (88 %) patients and no arrhythmic events were observed during follow-up in EP-quinidine responders treated by the medication. The latest study reporting the 33-year experience of the same group involved 96 patients with BrS (10 cardiac arrest survivors, 27 who presented with syncope and 59 who were asymptomatic). VF was induced in 66 (68.8 %) patients using an aggressive protocol of programmed ventricular stimulation (inducibility rates of 100 %, 74 % and 61 % in patients with cardiac arrest, syncope and no symptoms, respectively). All but six of the 66 patients with inducible VF underwent EPS on quinidine (n=54), disopyramide (n=2) or both (n=4). Two different formulations of quinidine were used during EP-guided therapy: quinidine bisulphate (QBS) (750–2000 mg daily) and hydroquinidine chlorhydrate (HQ) (600–900 mg daily). Fifty-four (90 %) patients were EP responders to more than one AD with similar efficacy rates (≈90 %) in all patient groups. After a mean follow-up of 113.3 ± 71.5 months, 92 patients were alive, whereas four had died from non-cardiac causes. No arrhythmic event occurred during class 1A AD therapy in any of the EP drug responders and in patients with no baseline inducible VF. Arrhythmic events occurred in only two cardiac arrest survivors treated with ICD alone but did not recur on quinidine. All cases of recurrent syncope (n=12) were attributed to a vasovagal (n=10) or nonarrhythmic mechanism (n=2). Class 1A AD resulted in a 38 % incidence of side-effects (mainly diarrhoea) that resolved after drug discontinuation. Sixty per cent of patients were compliant with the medication by the end of follow up.25 An illustrative example of the efficacy of quinidine in preventing VF induction is shown in Figures 1 and 2. Based on these results, Belhassen et al.25 suggested that EP-guided therapy may be an excellent alternative to ICD therapy in selected patients who are committed to a life-long drug therapy and exhibit good tolerance to the medication. The prophylactic use of empirical quinidine for asymptomatic patients with type 1 Brugada-ECG was first suggested by Viskin et al.48 Preliminary results in 19 patients who received empiric quinidine therapy were reported.49 No arrhythmic events occurred, and five patients (26 %) discontinued therapy due to side-effects. The administration of quinidine without further risk stratification to all asymptomatic patients with a type 1 Brugada-ECG is controversial. We routinely give quinidine to asymptomatic patients only in those who have inducible ventricular arrhythmias at EP testing.25 The recently published QUIDAM study: Hydroquinidine Therapy for the Management of Brugada Syndrome Patients at High Arrhythmic Risk50 is a prospective multicentre randomised (HQ versus placebo) double-blinded study with two 18-month crossover phases in high-risk patients with BrS and implanted with an ICD. Of the 50 patients enrolled, only 26 (52 %) fully completed both phases. Thirty-four (68 %) patients presented HQ-related side-effects, mainly gastrointestinal, which led to discontinuation of the therapy in 13 (26 %). During the 36-month follow-up period, two arrhythmic events occurred under placebo therapy (one appropriate ICD shock [0.97 % event per year] and one self-terminating VF). In addition, one inappropriate ICD shock occurred under placebo therapy. No arrhythmic events were reported under HQ therapy. The authors concluded that although HQ seems to be effective in preventing life-threatening arrhythmic events, it could not be an alternative for ICD implantation due to its frequent side-effects limiting compliance to the drug. This study, although well structured, was underpowered to prove the efficacy of HQ due to the small number of patients enrolled and even smaller number of patients who completed both phases. In addition, the very high incidence of side-effects reported was inconsistent with previous reports.25,27 In his editorial comment on the paper by Andorin et al., Belhassen51 pointed to the study’s patient population being mainly at intermediate and low arrhythmic risk, which explains the difficulty of assessing the efficacy of quinidine therapy, even more so with a small cohort population. In addition, he postulated that the high rate of side effects (mainly diarrhoea) requiring drug discontinuation could have been related to patients’ reluctance to continue the trial while they felt fully protected by the implanted ICDs. To decrease the frequency of side-effects associated with quinidine, administration of lower doses of the drug have been attempted. Márquez et al.47 reported a small series of six BrS patients, in whom doses of quinidine or hydroquinidine (<600 mg) prevented the recurrence of arrhythmic events in all patients without side-effects during a median follow-up of four years. In the literature review, 14 additional patients treated with <600 mg of quinidine were found. Quinidine was well tolerated and associated with acute and long-term arrhythmia control in 85 % of cases. In four patients who stopped taking the medication, recurrent arrhythmias occurred, which were successfully controlled after treatment was reinitiated.47 Hasegawa reported the normalisation of J waves and coved-type ST-segment elevation with VF suppression in a patient who presented with a VF storm after daily administration of 300 mg quinidine and a follow-up of 20 months.52 These data suggest that low doses of quinidine, which are generally well tolerated, may be useful in controlling arrhythmias. Further studies of larger scale are needed to validate the efficacy and safety of low-dose HQ. A major limitation for the wide use of quinidine in the world is its lack of accessibility.53,54 Viskin et al.54 asked a total of 273 physicians from 131 countries regarding the availability of quinidine in their countries. Quinidine was readily available in 19 countries (14 %), not accessible in 99 countries (76 %), and available only through specific regulatory processes that require 4 to 90 days for completion in 13 countries (10 %). Viskin et al.54 were able to gather information concerning 22 patients who had serious arrhythmias probably related (10 cases) or possibly related (12 cases) to the absence of quinidine, including two fatalities possibly attributable to the unavailability of quinidine. Miyazaki et al.57 reported the use of disopyramide in three BrS patients, and found that 50 mg of IV disopyramide resulted in augmentation of ST elevation. However, in one patient, the combined use of intravenous and oral disopyramide resulted in VF non-inducibility. Current data suggests that disopyramide may be useful in controlling ventricular arrhythmias in BrS; however, larger studies are needed to fully characterise the effect of oral and intravenous disopyramide in BrS. Milrinone is another phosphodiesterase III inhibitor recently identified as a more potent alternative to cilostazol in suppressing ST elevation and arrhythmogenesis in an experimental model of BrS.76,79 So far, no clinical data have been reported in humans. The effectiveness of bepridil in preventing VF, usually in combination with other drugs, has been described in several small studies and case reports.29,70,77,81–83 In a study of seven patients with repetitive VF episodes, Murakami et al.84 reported that the use of bepridil 100–200 mg daily prevented recurrence of VF along with improvement of ST elevation and of low-amplitude signals in four patients with BrS with the SCN5A mutation but not in those without this mutation. Bepridil was effective in the long-term prevention of VF in the highest-risk patients with electrical storms who demonstrated early repolarisation in addition to BrS.85 Addition of bepridil attenuated cilostazol-induced palpitations by eliminating sinus tachycardia, and maintained the suppressive effect of cilostazol against VF in a study of seven patients with J wave-syndrome-associated recurrent ICD shocks (five BrS patients).77 This effect of bepridil may be due to its effect to block If86 as well as its Ica-blocking effect.7 Currently, bepridil is available only in Japan. Dimethyl lithospermate B, an extract of danshen, a traditional Chinese herbal remedy, has been reported to slow inactivation of INa, thus increasing INa during the early phases of the action potential and suppressing arrhythmogenesis in experimental models of BrS.96 No clinical data are available yet. Amiodarone has not been shown to be effective in controlling arrhythmias in BrS.1,97,98 Moreover, there are a few case reports in which acute amiodarone infusion unmasked a Brugada phenotype ECG pattern and aggravated a VF storm.99–103 Amiodarone is predominantly a potassium ion channel–blocking agent, but has been shown in vitro to have sodium ion channel-blocking properties,104,105 especially in the acute phase of its administration. This effect provides a plausible scientific basis for unmasking BrS ECG pattern. Class IA (ajmaline, procainamide) and class IC (flecainide, propafenone and pilsicainide) sodium channel blockers drugs are known to unmask type I ST-segment elevation in the ECG and induce cardiac arrhythmias in BrS.56,85,97,109,114–123 The occurrence of cardiac arrhythmias during sodium channel blockers challenge ranges from 0–17.8 %.121 Hence, these drugs are contraindicated in the therapy of BrS. This review provides contemporary data on each of the drugs effective in the therapy of BrS. A pharmacological approach to therapy is aimed at rebalancing the epicardial action potential in the right ventricle, normalising the ECG abnormalities and preventing cardiac arrhythmias. Regardless of whether or not an ICD is implanted, prevention of recurrent arrhythmic events, especially in the high-risk population of cardiac arrest survivors, should be considered. Quinidine is the most extensively studied medication with proven efficacy in successfully controlling and preventing arrhythmic events in BrS. It is the authors’ opinion that this medication is an alternative to ICD therapy in all types of BrS patients who have fulfilled the strict conditions detailed elsewhere.124 Table 1 provides a summary of the drugs effective in BrS, their recommended dosing and their utility. Brugada P, Brugada J. Right bundle branch block, persistent ST segment elevation and sudden cardiac death: a distinct clinical and electrocardiographic syndrome. A multicenter report. J Am Coll Cardiol 1992;20:1391–6. Shen WK, Sheldon RS, Benditt DG, et al. 2017 ACC/AHA/HRS guideline for the evaluation and management of patients with syncope: A report of the American College of Cardiology/American Heart Association Task Force on Clinical Practice Guidelines and the Heart Rhythm Society. Heart Rhythm 2017;14:e155–217. Priori SG, Blomström-Lundqvist C, Mazzanti A, et al. 2015 ESC Guidelines for the management of patients with ventricular arrhythmias and the prevention of sudden cardiac death: The Task Force for the Management of Patients with Ventricular Arrhythmias and the Prevention of Sudden Cardiac Death of the European Society of Cardiology (ESC)Endorsed by: Association for European Paediatric and Congenital Cardiology (AEPC). Europace 2015;17:1601–87. Antzelevitch C, Yan GX, Ackerman MJ, et al. J-wave syndromes expert consensus conference report: Emerging concepts and gaps in knowledge. J Arrhythm 2016;32:315–39. Antzelevitch C. Ion channels and ventricular arrhythmias: cellular and ionic mechanisms underlying the Brugada syndrome. Curr Opin Cardiol 1999;14:274–9. Patocskai B, Antzelevitch C. Novel therapeutic strategies for the management of ventricular arrhythmias associated with the Brugada syndrome. Expert Opin Orphan Drugs 2015;3:633–51. Márquez MF, Salica G, Hermosillo AG, et al. Ionic basis of pharmacological therapy in Brugada syndrome. J Cardiovasc Electrophysiol 2007;18:234–40. Probst V, Veltmann C, Eckardt L, et al. Long-term prognosis of patients diagnosed with Brugada syndrome: results from the FINGER Brugada syndrome registry. Circulation 2010;121:635–43. Kamakura S, Ohe T, Nakazawa K, et al. Long-term prognosis of probands with Brugada-pattern ST-elevation in leads V1-V3. Circ Arrhythm Electrophysiol 2009;2:495–503. Miyazaki S, Uchiyama T, Komatsu Y, et al. Long-term complications of implantable defibrillator therapy in Brugada syndrome. Am J Cardiol 2013;111:1448–51. Rosso R, Glick A, Glikson M, et al. Outcome after implantation of cardioverter defibrillator in patients with Brugada syndrome: a multicenter Israeli study (ISRABRU). Isr Med Assoc J 2008;10:435–9. Sacher F, Probst V, Maury P, et al. Outcome after implantation of a cardioverter-defibrillator in patients with Brugada syndrome: a multicenter study-part 2. Circulation 2013;128:1739–47. Sacher F, Probst V, Bessouet M, et al. Remote implantable cardioverter defibrillator monitoring in a Brugada syndrome population. Europace 2009;11:489–94. Belhassen B, Viskin S. Near fatal ventricular fibrillation in Brugada syndrome despite presence of an implanted implantable cardioverter defibrillator. Can J Cardiol 2014;30:1460.e3–5. Hernandez-Ojeda J, Arbelo E, Borras R, et al. Patients with Brugada syndrome and implanted cardioverter-defibrillators: long-term follow-up. J Am Coll Cardiol 2017;70:1991–2002. Gonzalez Corcia MC, Sieira J, Pappaert G, et al. Implantable cardioverter-defibrillators in children and adolescents with Brugada syndrome. J Am Coll Cardiol 2018;71:148–57. Antzelevitch C, Patocskai B. Brugada syndrome: clinical, genetic, molecular, cellular, and ionic aspects. Curr Probl Cardiol 2016;41:7–57. Antzelevitch C. The Brugada syndrome. J Cardiovasc Electrophysiol 1998;9:513–16. Belhassen B, Pelleg A, Miller HI, Laniado S. Serial electrophysiological studies in a young patient with recurrent ventricular fibrillation. Pacing Clin Electrophysiol 1981;4:92–9. Belhassen B, Shapira I, Shoshani D, et al. Idiopathic ventricular fibrillation: inducibility and beneficial effects of class I antiarrhythmic agents. Circulation 1987;75:809–16. Belhassen B, Glick A, Viskin S. Efficacy of quinidine in high-risk patients with Brugada syndrome. Circulation. 2004;110:1731–7. Belhassen B, Rahkovich M, Michowitz Y, et al. Management of Brugada syndrome: thirty-three-year experience using electrophysiologically guided therapy with class 1A antiarrhythmic drugs. 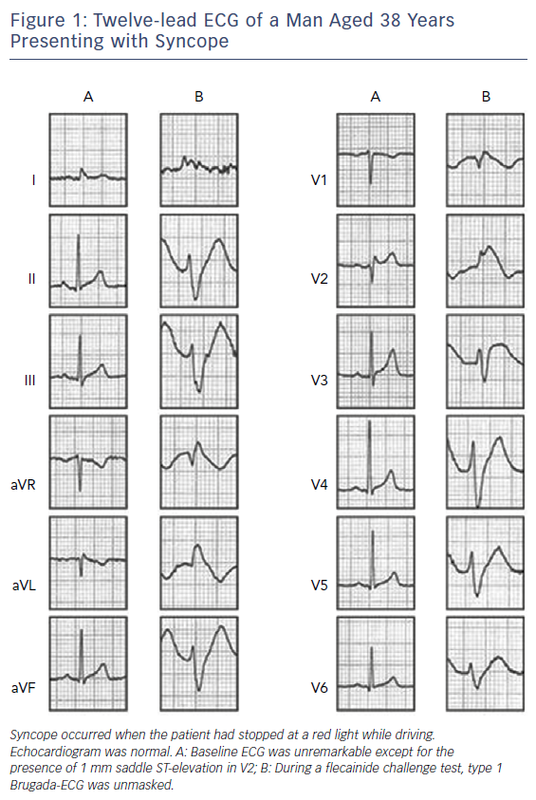 Circ Arrhythm Electrophysiol 2015;8:1393–1402. Hermida JS, Denjoy I, Clerc J, et al. Hydroquinidine therapy in Brugada syndrome. J Am Coll Cardiol 2004;43:1853–60. Bouzeman A, Traulle S, Messali A, et al. Long-term follow-up of asymptomatic Brugada patients with inducible ventricular fibrillation under hydroquinidine. Europace 2014;16:572–7. Belhassen B, Viskin S, Fish R, et al. Effects of electrophysiologic-guided therapy with Class IA antiarrhythmic drugs on the long-term outcome of patients with idiopathic ventricular fibrillation with or without the Brugada syndrome. J Cardiovasc Electrophysiol 1999;10:1301–12. Ohgo T, Okamura H, Noda T, et al. Acute and chronic management in patients with Brugada syndrome associated with electrical storm of ventricular fibrillation. Heart Rhythm 2007;4:695–700. Takigawa M, Noda T, Shimizu W, et al. Seasonal and circadian distributions of ventricular fibrillation in patients with Brugada syndrome. Heart Rhythm 2008;5:1523–7. Watanabe A, Fukushima Kusano K, Morita H, et al. Low-dose isoproterenol for repetitive ventricular arrhythmia in patients with Brugada syndrome. Eur Heart J 2006;27:1579–83. Shenthar J, Chakali SS, Acharya D, et al. Oral quinine sulfate for the treatment of electrical storm and prevention of recurrent shocks in Brugada syndrome after failed cilostazol therapy. HeartRhythm Case Rep 2017;3:470–4. Schweizer PA, Becker R, Katus HA, Thomas D. Successful acute and long-term management of electrical storm in Brugada syndrome using orciprenaline and quinine/quinidine. Clin Res Cardiol 2010;99:467–70. Pellegrino PL, Di Biase M, Brunetti ND. Quinidine for the management of electrical storm in an old patient with Brugada syndrome and syncope. Acta Cardiol 2013;68:201–3. Paraskevaidis S, Theofilogiannakos EK, Kamperidis V, et al. Quinidine: an “endangered species” drug appropriate for management of electrical storm in brugada syndrome. Indian Pacing Electrophysiol J 2013;13:178–80. Mok NS, Chan NY, Chiu AC. Successful use of quinidine in treatment of electrical storm in Brugada syndrome. Pacing Clin Electrophysiol 2004;27:821–3. Furniss G. Isoprenaline and quinidine to calm Brugada VF storm. BMJ Case Rep 2012; Aug 13;2012. pii: bcr0420114156. Márquez MF, Rivera J, Hermosillo AG, et al. Arrhythmic storm responsive to quinidine in a patient with Brugada syndrome and vasovagal syncope. Pacing Clin Electrophysiol 2005;28:870–3. Jongman JK, Jepkes-Bruin N, Ramdat Misier AR, et al. Electrical storms in Brugada syndrome successfully treated with isoproterenol infusion and quinidine orally. Neth Heart J 2007;15:151–5. Bettiol K, Gianfranchi L, Scarfò S, et al. Successful treatment of electrical storm with oral quinidine in Brugada syndrome. Ital Heart J 2005;6:601–2. Haghjoo M, Arya A, Heidari A, et al. Suppression of electrical storm by oral quinidine in a patient with Brugada syndrome. J Cardiovasc Electrophysiol 2005;16:674. Anguera I, García-Alberola A, Dallaglio P, et al. Shock reduction with long-term quinidine in patients with Brugada syndrome and malignant ventricular arrhythmia episodes. J Am Coll Cardiol 2016;67:1653–4. Baruteau AE, Mabo P, Probst V. Quinidine therapy in children affected by Brugada syndrome: are we far from a safe alternative? Cardiol Young 2009;19:652–4. Crosson JE, Nies M. Brugada syndrome in children. Expert Rev Cardiovasc Ther 2015;13:173–81. Sharif-Kazemi MB, Emkanjoo Z, Tavoosi A, et al. Electrical storm in Brugada syndrome during pregnancy. Pacing Clin Electrophysiol 2011;34:e18–21. Márquez MF, Bonny A, Hernández-Castillo E, et al. Long-term efficacy of low doses of quinidine on malignant arrhythmias in Brugada syndrome with an implantable cardioverter-defibrillator: a case series and literature review. Heart Rhythm 2012;9:1995–2000. Adler A, Olde Nordkamp L, Crotti L, et al. Empiric quinidine for asymptomatic Brugada syndrome – preliminary results of an international registry. Heart Rhythm 2012;9:1918–9. Andorin A, Gourraud JB, Mansourati J, et al. The QUIDAM study: Hydroquinidine therapy for the management of Brugada syndrome patients at high arrhythmic risk. Heart Rhythm 2017;14:1147–54. Belhassen B. Assessing the clinical efficacy of quinidine in Brugada syndrome: “Mission: Impossible”? Heart Rhythm 2017;14:1155–6. Hasegawa K, Ashihara T, Kimura H, et al. Long-term pharmacological therapy of Brugada syndrome: is J-wave attenuation a marker of drug efficacy? Intern Med 2014;53:1523–6. Viskin S, Belhassen B, Wilde AA. 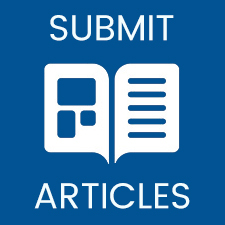 To the editor – Irreplaceable antiarrhythmic medications are disappearing: the case of quinidine. Heart Rhythm 2010;7:863. Viskin S, Wilde AA, Guevara-Valdivia ME, et al. Quinidine, a life-saving medication for Brugada syndrome, is inaccessible in many countries. J Am Coll Cardiol 2013;61:2383–7. Levites R, Anderson GJ. Electrophysiological effects of disopyramide phosphate during experimental myocardial ischemia. Am Heart J 1979;98:339–44. Shimizu W, Antzelevitch C, Suyama K, et al. Effect of sodium channel blockers on ST segment, QRS duration, and corrected QT interval in patients with Brugada syndrome. J Cardiovasc Electrophysiol 2000;11:1320–9. Miyazaki T, Mitamura H, Miyoshi S, et al. Autonomic and antiarrhythmic drug modulation of ST segment elevation in patients with Brugada syndrome. J Am Coll Cardiol 1996;27:1061–70. Sumi S, Maruyama S, Shiga Y, et al. High efficacy of disopyramide in the management of ventricular fibrillation storms in a patient with Brugada syndrome. Pacing Clin Electrophysiol 2010;33:e53–6. Chinushi M, Aizawa Y, Ogawa Y, et al. Discrepant drug action of disopyramide on ECG abnormalities and induction of ventricular arrhythmias in a patient with Brugada syndrome. J Electrocardiol 1997;30:133–6. Klevans LR, Kelly RJ, Kovacs JL. Comparison of the antiarrhythmic activity of quinidine and quinine. Arch Int Pharmacodyn Ther 1977;227:57–68. Sheldon R, Duff H, Koshman ML. Antiarrhythmic activity of quinine in humans. Circulation 1995;92:2944–50. Mehrotra S, Juneja R, Naik N, Pavri BB. Successful use of quinine in the treatment of electrical storm in a child with Brugada syndrome. J Cardiovasc Electrophysiol 2011;22:594–7. Kyriazis K, Bahlmann E, van der Schalk H, Kuck KH. Electrical storm in Brugada syndrome successfully treated with orciprenaline; effect of low-dose quinidine on the electrocardiogram. Europace 2009;11:665–6. Vega J, Enríquez A, Vergara I, et al. Electrical storm in Brugada syndrome successfully treated with isoproterenol. Report of a case. Rev Med Chil 2013;141:1340–3. Omiya T, Shimizu A, Ueyama T, et al. Effects of isoproterenol and propranolol on the inducibility and frequency of ventricular fibrillation in patients with Brugada syndrome. J Cardiol 2012;60:47–54. Mittadodla PS, Salen PN, Traub DM. Isoproterenol as an adjunct for treatment of idiopathic ventricular fibrillation storm in a pregnant woman. Am J Emerg Med 2012;30:251.e253–5. Márquez MF, Salica G, Hermosillo AG, et al. Drug therapy in Brugada syndrome. Curr Drug Targets Cardiovasc Haematol Disord 2005;5:409–17. Dakkak M, Baxi K, Patel A. Beneficial effects of isoproterenol and quinidine in the treatment of ventricular fibrillation in Brugada syndrome. Case Rep Cardiol 2015;2015:753537. Antzelevitch C, Fish JM. Therapy for the Brugada syndrome. Handb Exp Pharmacol 2006;171:305–30. Aizawa Y, Takatsuki S, Inagawa K, et al. Storms of ventricular fibrillation responsive to isoproterenol in an idiopathic ventricular fibrillation patient demonstrating complete right bundle branch block. Int Heart J 2013;54:240–2. Einbinder T, Lowenthal A, Fogelman R. Ventricular fibrillation storm in a child. Europace 2014;16:1654. Tsuchiya T, Ashikaga K, Honda T, Arita M. Prevention of ventricular fibrillation by cilostazol, an oral phosphodiesterase inhibitor, in a patient with Brugada syndrome. J Cardiovasc Electrophysiol 2002;13:698–701. Iguchi K, Noda T, Kamakura S, Shimizu W. Beneficial effects of cilostazol in a patient with recurrent ventricular fibrillation associated with early repolarization syndrome. Heart Rhythm 2013;10:604–6. Kanlop N, Chattipakorn S, Chattipakorn N. Effects of cilostazol in the heart. J Cardiovasc Med (Hagerstown) 2011;12:88–95. Ag˘aç MT, Erkan H, Korkmaz L. Conversion of Brugada type I to type III and successful control of recurrent ventricular arrhythmia with cilostazol. Arch Cardiovasc Dis 2014;107:476–8. Szél T, Koncz I, Antzelevitch C. Cellular mechanisms underlying the effects of milrinone and cilostazol to suppress arrhythmogenesis associated with Brugada syndrome. Heart Rhythm 2013;10:1720–7. Shinohara T, Ebata Y, Ayabe R, et al. Combination therapy of cilostazol and bepridil suppresses recurrent ventricular fibrillation related to J-wave syndromes. Heart Rhythm 2014;11:1441–5. Abud A, Bagattin D, Goyeneche R, Becker C. Failure of cilostazol in the prevention of ventricular fibrillation in a patient with Brugada syndrome. J Cardiovasc Electrophysiol 2006;17:210–12. Szél T, Antzelevitch C. Abnormal repolarization as the basis for late potentials and fractionated electrograms recorded from epicardium in experimental models of Brugada syndrome. J Am Coll Cardiol 2014;63:2037–45. Kang L, Zheng MQ, Morishima M, et al. Bepridil up-regulates cardiac Na+ channels as a long-term effect by blunting proteasome signals through inhibition of calmodulin activity. Br J Pharmacol 2009;157:404–14. Sugao M, Fujiki A, Nishida K, et al. Repolarization dynamics in patients with idiopathic ventricular fibrillation: pharmacological therapy with bepridil and disopyramide. J Cardiovasc Pharmacol 2005;45:545–9. Chinushi M, Iijima K, Sato A, Furushima H. Short-coupling premature ventricular complexes from the left ventricle triggered isoproterenol-resistant electrical storm in a patient with Brugada syndrome. Heart Rhythm 2013;10:916–20. Murakami M, Nakamura K, Kusano KF, et al. Efficacy of low-dose bepridil for prevention of ventricular fibrillation in patients with Brugada syndrome with and without SCN5A mutation. J Cardiovasc Pharmacol 2010;56:389–95. Kaneko Y, Horie M, Niwano S, et al. Electrical storm in patients with brugada syndrome is associated with early repolarization. Circ Arrhythm Electrophysiol 2014;7:1122–8. Tamura A, Ogura T, Uemura H, et al. Effects of antiarrhythmic drugs on the hyperpolarization-activated cyclic nucleotide-gated channel current. J Pharmacol Sci 2009;110:150–9. Xue X, Guo D, Sun H, et al. Wenxin Keli suppresses ventricular triggered arrhythmias via selective inhibition of late sodium current. Pacing Clin Electrophysiol 2013;36:732–40. Meng Z, Tan J, He Q, et al. Wenxin Keli versus sotalol for paroxysmal atrial fibrillation caused by hyperthyroidism: A prospective, open label, and randomized study. Evid Based Complement Alternat Med 2015;2015:101904. Liu Y, Zhang Z, Yang Y, et al. The Chinese herb extract wenxin keli: A promising agent for the management of atrial fibrillation. Int J Cardiol 2016;203:614–5. Hua W, Gao RL, Zhao BC, et al. The efficacy and safety of Wenxin Keli in patients with frequent premature ventricular contractions: a randomized, double-blind, placebo-controlled, parallel-group, multicenter Trial. Chin Med J (Engl) 2015;128:2557–64. He M, Lv Z, Yang ZW, et al. Efficacy and safety of Chinese herbal medicine Wenxin Keli for ventricular premature beats: A systematic review. Complement Ther Med 2016;29:181–9. Burashnikov A, Petroski A, Hu D, et al. Atrial-selective inhibition of sodium-channel current by Wenxin Keli is effective in suppressing atrial fibrillation. Heart Rhythm 2012;9:125–31. Kalifa J, Avula UM. The Chinese herb extract Wenxin Keli: atrial selectivity from the Far East. Heart Rhythm 2012;9:132–3. Wang X, Gu Y, Wang T, Huang C. Wenxin Keli attenuates ischemia-induced ventricular arrhythmias in rats: Involvement of L-type calcium and transient outward potassium currents. Mol Med Rep 2013;7:519–24. Minoura Y, Panama BK, Nesterenko VV, et al. Effect of Wenxin Keli and quinidine to suppress arrhythmogenesis in an experimental model of Brugada syndrome. Heart Rhythm 2013;10:1054–62. Fish JM, Welchons DR, Kim YS, et al. Dimethyl lithospermate B, an extract of Danshen, suppresses arrhythmogenesis associated with the Brugada syndrome. Circulation 2006;113:1393–1400. Brugada J, Brugada P, Brugada R. The syndrome of right bundle branch block ST segment elevation in V1 to V3 and sudden death--the Brugada syndrome. Europace 1999;1:156–66. Brugada J, Brugada R, Brugada P. Right bundle-branch block and ST-segment elevation in leads V1 through V3: a marker for sudden death in patients without demonstrable structural heart disease. Circulation 1998;97:457–60. D’Aloia A, Vizzardi E, Bugatti S, et al. Brugada syndrome phenotype cardiac arrest in a young patient unmasked during the acute phase of amiodarone infusion: disclosure and aggravation of Brugada electrocardiographic pattern. J Electrocardiol 2012;45:411–3. Lee CW, Jassam Y, Braganza D, Virdee M. Oral amiodarone provoking inferior ST elevation and unmasking Brugada-like electrocardiogram feature. Europace 2012;14:1065–6. Joshi S, Raiszadeh F, Pierce W, Steinberg JS. Antiarrhythmic induced electrical storm in Brugada syndrome: a case report. Ann Noninvasive Electrocardiol 2007;12:274–8. Nägele H, Behrens S, Castel A. Ventricular tachycardia and aggravation of Brugada ECG pattern in a patient with coronary artery disease and combined amiodarone and betablocker therapy. Clin Res Cardiol 2008;97:56–60. Paul G, Yusuf S, Sharma S. Unmasking of the Brugada syndrome phenotype during the acute phase of amiodarone infusion. Circulation 2006;114:e489–91. Lalevée N, Nargeot J, Barrére-Lemaire S, et al. Effects of amiodarone and dronedarone on voltage-dependent sodium current in human cardiomyocytes. J Cardiovasc Electrophysiol 2003;14:885–90. Sheldon RS, Hill RJ, Cannon NJ, Duff HJ. Amiodarone: biochemical evidence for binding to a receptor for class I drugs associated with the rat cardiac sodium channel. Circ Res 1989;65:477–82. Nademanee K, Veerakul G, Mower M, et al. Defibrillator versus beta-Blockers for unexplained death in Thailand (DEBUT): a randomized clinical trial. Circulation 2003;107:2221–6. Antzelevitch C, Brugada P, Borggrefe M, et al. Brugada syndrome: report of the second consensus conference: endorsed by the Heart Rhythm Society and the European Heart Rhythm Association. Circulation 2005;111:659–70. Antzelevitch C, Yan GX, Ackerman MJ, et al. J-wave syndromes expert consensus conference report: Emerging concepts and gaps in knowledge. Europace 2017;19:665–94. Fish JM, Antzelevitch C. Role of sodium and calcium channel block in unmasking the Brugada syndrome. Heart Rhythm 2004;1:210–17. Rennyson SL, Littmann L. Brugada-pattern electrocardiogram in propranolol intoxication. Am J Emerg Med 2010;28:256.e257–8. Aouate P, Clerc J, Viard P, Seoud J. Propranolol intoxication revealing a Brugada syndrome. J Cardiovasc Electrophysiol 2005;16:348–51. Kasanuki H, Ohnishi S, Ohtuka M, et al. Idiopathic ventricular fibrillation induced with vagal activity in patients without obvious heart disease. Circulation 1997;95:2277–85. Kamakura T, Wada M, Ishibashi K, et al. Feasibility evaluation of long-term use of beta-blockers and calcium antagonists in patients with Brugada syndrome. Europace 2017. Poli S, Toniolo M, Maiani M, et al. Management of untreatable ventricular arrhythmias during pharmacologic challenges with sodium channel blockers for suspected Brugada syndrome. Europace 2018;20:234–42. Brembilla-Perrot B. Pharmacological testing in the diagnosis of arrhythmias. Minerva Cardioangiol 2010;58:505–17. Brugada R, Brugada P, Brugada J. Electrocardiogram interpretation and class I blocker challenge in Brugada syndrome. J Electrocardiol 2006;39:S115–8. Dubner S, Azocar D, Gallino S, et al. Single oral flecainide dose to unmask type 1 Brugada syndrome electrocardiographic pattern. Ann Noninvasive Electrocardiol 2013;18:256–61. Somani R, Krahn AD, Healey JS, et al. Procainamide infusion in the evaluation of unexplained cardiac arrest: from the Cardiac Arrest Survivors with Preserved Ejection Fraction Registry (CASPER). Heart Rhythm 2014;11:1047–54. Gavrielatos G, Letsas KP, Pappas LK, et al. Sensitivity and specificity of sodium channel blocking test in the diagnosis of Brugada syndrome. Int J Cardiol 2010;141:e31–3. Evain S, Briec F, Kyndt F, et al. Sodium channel blocker tests allow a clear distinction of electrophysiological characteristics and prognosis in patients with a type 2 or 3 Brugada electrocardiogram pattern. Heart Rhythm 2008;5:1561–4. Dobbels B, De Cleen D, Ector J. Ventricular arrhythmia during ajmaline challenge for the Brugada syndrome. Europace 2016;18:1501–6. Fujiki A, Usui M, Nagasawa H, et al. ST segment elevation in the right precordial leads induced with class IC antiarrhythmic drugs: insight into the mechanism of Brugada syndrome. J Cardiovasc Electrophysiol 1999;10:214–18. Brugada R, Brugada J, Antzelevitch C, et al. Sodium channel blockers identify risk for sudden death in patients with ST-segment elevation and right bundle branch block but structurally normal hearts. Circulation 2000;101:510–15. Belhassen B, Viskin S, Antzelevitch C. The Brugada syndrome: is an implantable cardioverter defibrillator the only therapeutic option? Pacing Clin Electrophysiol 2002;25:1634–40.